With the pencil drawing completed and transferred to the smooth side of my watercolor paper I am ready to begin the pen and ink drawing stage. In addition to using pen and ink to draw with I also use some brushes to lay down washes of various ink tones. Some of these washes are produced by using a brush with just water with which I touch the wet ink I lay down with my pen to cause the ink to flow. 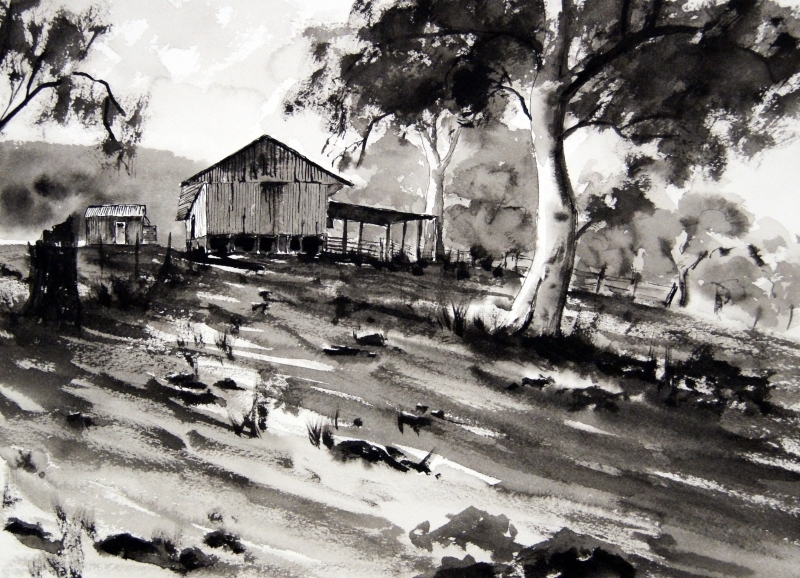 Other washes are produced solely with a brush and diluted ink applied directly to the paper. 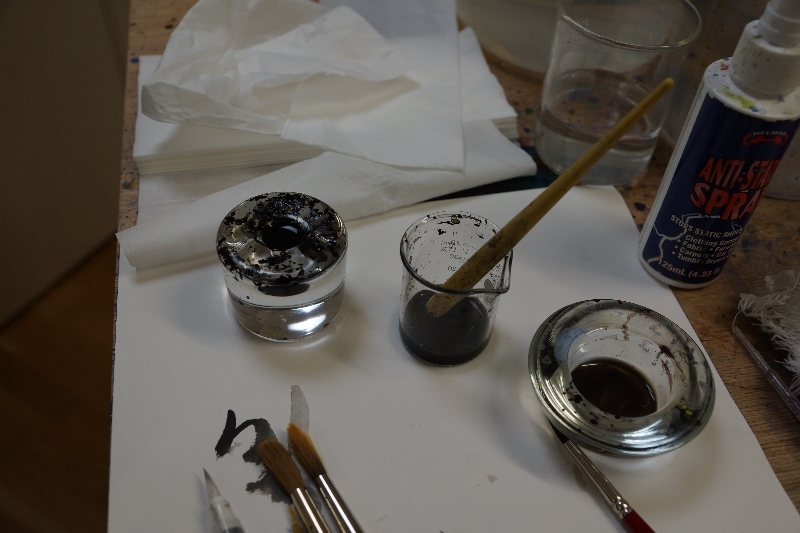 Figure 5 shows you how I use the various containers to mix different strength black mixtures of ink and water. I start my Pen and Ink work with the distant area first. This is a region called North Sydney. As this is the most distant part of my drawing I use ink which has been mixed with lots of water to lighten its tone. I mix the ink with water in a separate container and add more ink when I need to increase its tone as the scene comes forward. Figure 6: I start my pen and ink work with the distant region first. After finishing the distant shore I started on the bridge. The important thing is to get your tones right. The more distant parts of the Bridge are lighter and the tones increase in strength as you move closer to the foreground. I do not aim for a full mechanical rendition of the bridge – that would take forever and is not what I like to do. I work to convey a believable impression of the Bridge structure concentrating on getting the overall shapes and tones right. 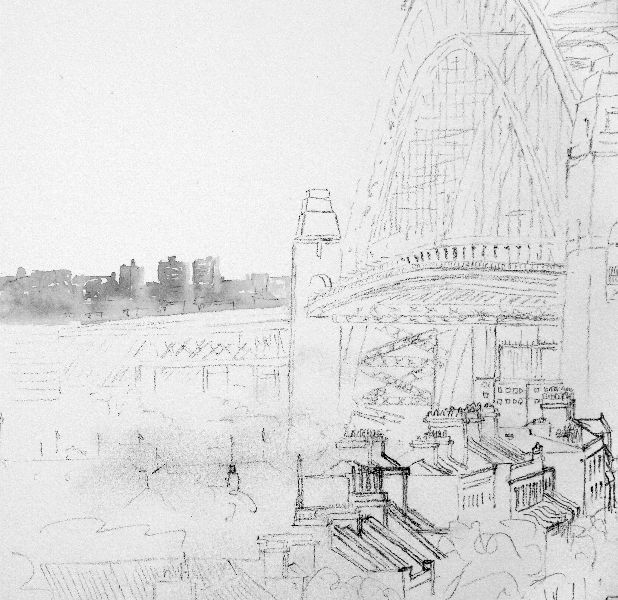 Figure 7: Starting the Sydney Harbor Bridge in Pen and Ink. 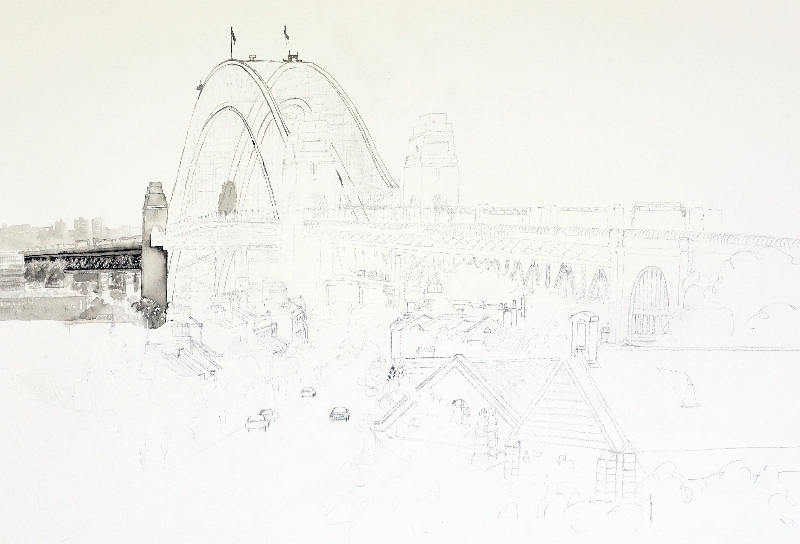 I complete the rendition of the Bridge before I start work on the foreground buildings. 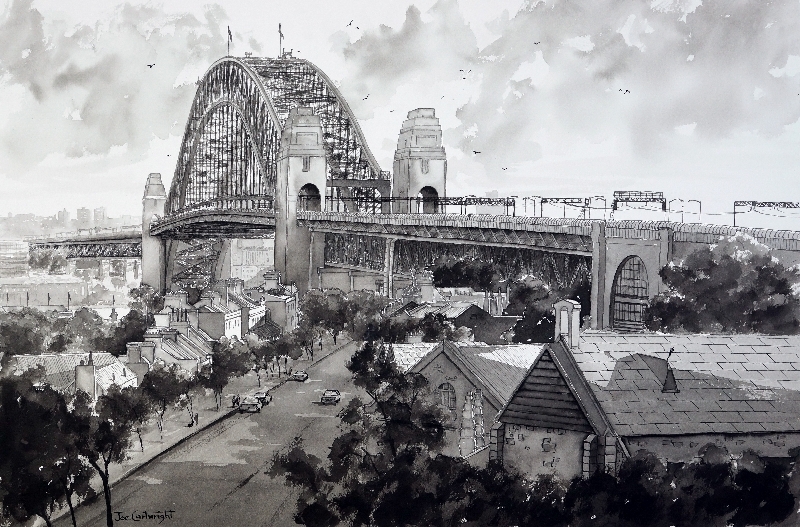 Figure 8: Completed Sydney Harbor Bridge in pen and ink. 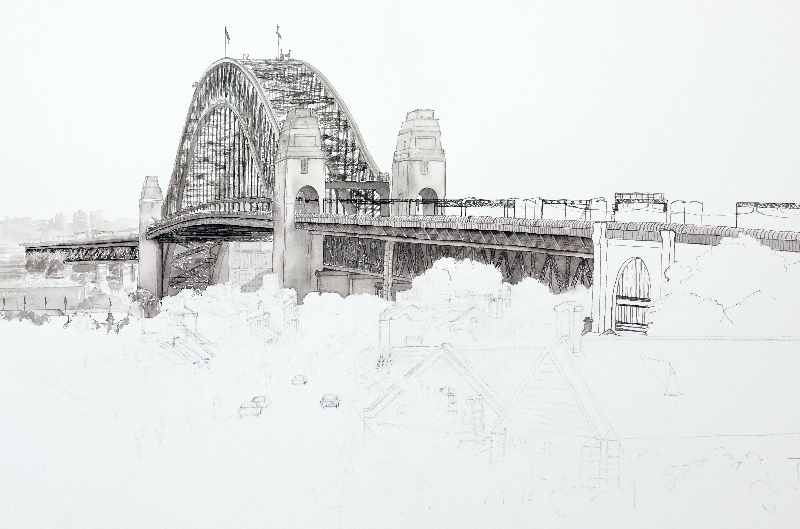 I start work on the foreground buildings and road on the left hand side. I keep very close attention on where I want the light to appear in my drawing. This is very important as without the light on the buildings the scene can look quite dull. Figure 9: Drawing buildings with pen and ink. After the buildings on the left hand side are completed I do the same on the right hand side. 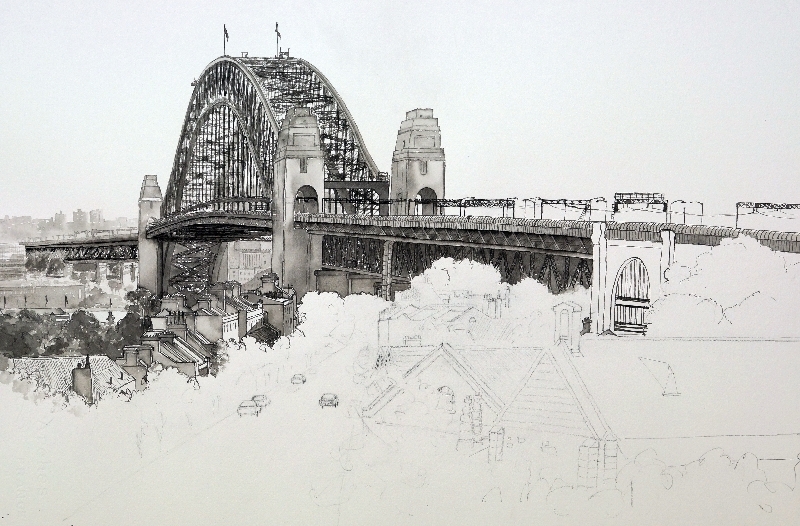 A number of the buildings on the right hand side are closer to the viewer so I make these stronger in tones. I hint at the brickwork in some of the buildings by just putting in a few brick like shapes with my pen. Figure 10: Completing the buildings in pen and ink and brush. With the buildings and all the trees and bushes finished I go back and do the road. The road and the cars on it are completed first and this stage is left to dry. The final step is to paint the shadows on the road surface. You have to keep in mind the direction of the light in your painting / drawing as that is what determines the direction of the shadows i.e. away from the light. I sign my pen and ink and wash painting with my pen and it is all finished. Hopefully I have been able to give you enough detail on the technique I used that you will be able to complete your own, similar, pen and ink, and wash painting. Good luck. 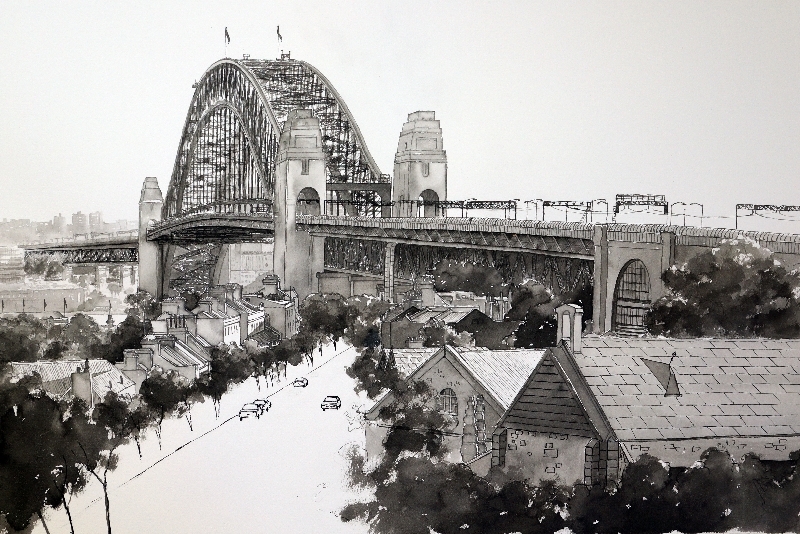 Figure 11: Finished Pen, ink, and wash painting of The Rocks Sydney.